Louise Bryan Head Sasser, 94, left this world to be with Jesus early Monday morning at Kitty Askins Hospice Center. Louise was born in Wayne County on May 21, 1924, one of ten children, to the late Eugene Miller Head and Prudence Bryan Head. She was preceded in death by her husband of 56 years, former Wayne County Sheriff, James L. Sasser. Louise retired from Goodyear after 25 years of service and later worked with Southern Bank in the Grantham community. Her warmth, generosity and kind spirit were well known and cherished by those she encountered throughout her life. Family was paramount to Louise, and she loved nothing more than her husband, her children, and grandchildren. 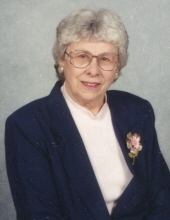 Louise loved Falling Creek Baptist Church and served as their treasurer for many years. She later became a member of Selah Christian Church. A service celebrating Louise’s life will be held at 5:00 p.m. on Friday, March 22, 2019 in Falling Creek Baptist Church Cemetery with Pastor Patrick Muston officiating. The family will greet friends Friday following the service at the cemetery. Louise is survived by her children, Jimmy Sasser and wife Ann of Goldsboro, Brenda James and husband Carlton of Clayton, and Jay Sasser and wife Amy of Goldsboro; seven grandchildren, Leslie Sasser Denning and husband Andrew, Bonnie Sasser Bentley and husband Jud, Josh Sasser, Justin James and friend Lauren Hamilton, Lindsay J. Pope and husband Jason, Jacob Sasser and Aubrey Sasser; five great-grandchildren, Scarlett, Conner, Karlee, Tucker and Magnolia Louise; and several nieces and nephews she loved very much. Flowers are welcome or memorials may be made to Selah Christian Church, c/o Jason Thornton, 4294 US 13 South, Goldsboro, NC 27530 or to Kitty Askins Hospice Center, 107 Handley Park Court, Goldsboro, NC 27534. To send flowers or a remembrance gift to the family of Louise Head Sasser, please visit our Tribute Store. "Email Address" would like to share the life celebration of Louise Head Sasser. Click on the "link" to go to share a favorite memory or leave a condolence message for the family.